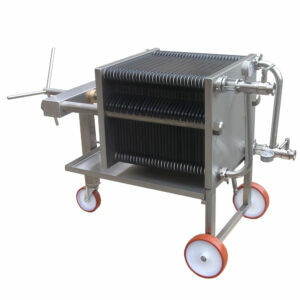 ErtrelAlsop’s 40 cm x 40 cm filter press, is the ideal filter to compliment any distillery, brewery, or winery. Our externally ported, multi-sheet plate filter is the most versatile piece of equipment a brew master or distiller can own. This superior quality beverage filter press consists of a 304 stainless steel frame mounted on casters with a stainless steel drip collection tray to collect any leakage from the filter. Additionally, all of our 40 x 40 cm filters come stock with food grade NORYL filter plates which can be steam sterilized for easy cleaning. The press come equipped with stainless steel butterfly valves with sight glass to be able to monitor both the inlet and outlet fluid being processed. The sanitary branched piping links the 2 inlet and outlet ports for faster fill and discharge. A dividing head is also an option, which allows for 2-stage (double) filtration. Double filtration allows for your product to pass through a coarse filter media, and then also through a polishing filter media while passing through the press only once. Not only does this save you time, but it also reduces the amount of product agitation and handling.